Da Gwapitos are a surf team with HeadQuarter at Kermit Surf Resort Siargao. 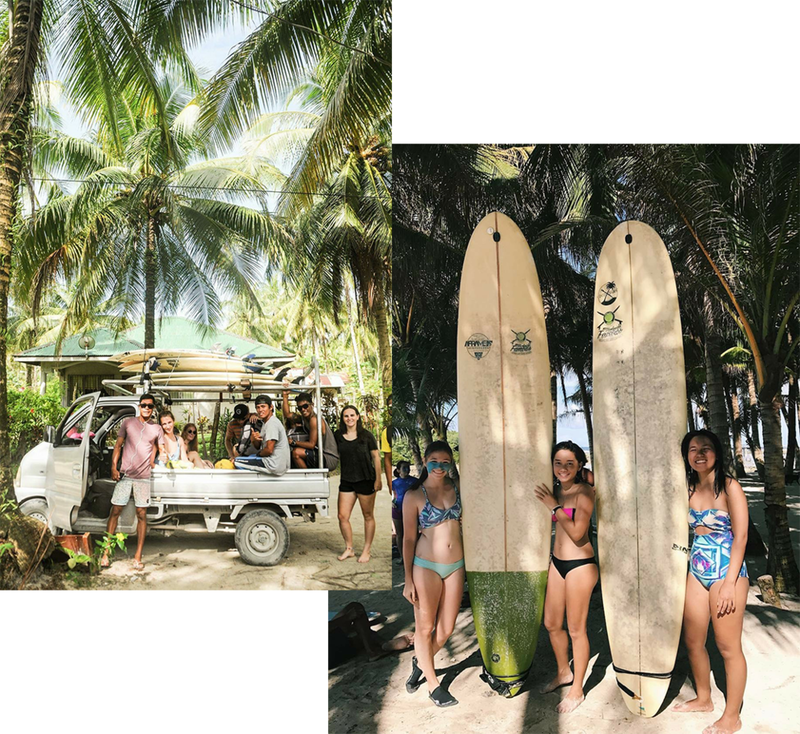 With Da Gwapitos you will feel the original and old Siargao Island vibe. They will be your best friends and family in Siargao from the first minute of your arrival. Kermit Siargao with the Gwapitos is the number one surfschool and camp in Siargao Island. the surf school being running and teaching since 2010. The Head instructors Eloy and Jong are ISA (International Surf Association) level one certified and they have more than 20 years of surf experience in local water. There are a total of 17 surf instructors all with amazing teaching and surfing skills. Most of them are freesurfer, the purest way to enjoy surf. Some they compete professionally both Longboarding and Shortboarding like John Mark "Marama" Tokong (one of the top Filipino surfer) and Maricel Parajes competing as longboarder. With over 10 accessible surf breaks in our vicinity, anyone can experience quality waves good for all levels. 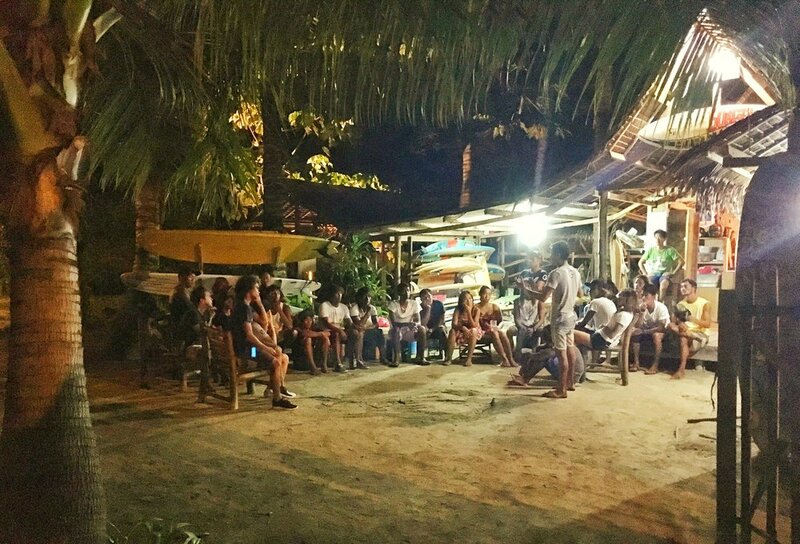 We organize daily surf lessons and group trips to the different spots. To the best spots. Never surfed before? No problem. We have 9 years of surschool expertise in the island of Siargao. Choose from One lesson 1200 php to multiple day package. Pass by and say hi at our Surfshack and Gwapitos HQ. In the “learn to surf package” is absolutely friendly for all beginner and aspiring entry level surfers. It is very intimate and the focus will be on your progress, as the student instructor ratio is 1:1. Aside from the basic surfing rules and etiquette, your instructor will also help you to discover develop your own style of surfing by bringing you to different spots in the island, as well as letting you decide which board size and style you are most comfortable with. This package is suitable from novice to beginner to beginner-intermediate. Accommodation is NOT included. Please check the accommodation section and choose the one you like the best. Packages are also suitable for guests not staying at Kermit Siargao. SURF GUIDING AND TEACHING: Two surf lesson per day to the best surf spot. 1:1 teaching ratio. EQUIPMENT: Everything you need for the waves. From your board, to your leash. INTERNET: Free WIFI connection at the resort. Go on a surfari, the best option for people who have previous surfing experience and are already confident in the water. With a 1:1 or 1:2 instructor student ratio, your guide will bring you on daily trips to the best breaks in the island. All suited and tailored to your skill level and abilities. Intermediate to advance only. Soak up the sun, get in the water and be prepared to get the ride of your life. Best season for surfari is September to May. 5 minutes motorbike from the Resort. A perfect barreling right mainly but also left. Wave breaking over a quite soft reef. It's a world class wave and can get very crowded and very heavy. Best to be surf during mid to high tide. But possible to surf even low tide, just very shallow. Although it is a relatively short wave, it barrels nearly the whole way and guarantees high satisfaction. Not a beginner wave. Take turns and respect locals. Located next to Cloud 9, it's a similar wave but normally smaller in size. The wave is normally a right, but sometimes the left is good as well. Although not as infamous as Cloud 9, it should not be underestimated, as it can be quite heavy. Best to be surf during mid to high tide; low tide is breaking over dry reef shallow. It’s a fast wave with a beginning barreling section. Small can be a beginner wave but big is very heavy. A jacking peak that explodes on to a shallow reef can be surfed all tides, just be careful low tide. It can be left and right. The right can get very long. The wave then reforms on the inner reef creating a beginner wave named Little Pony. In front of the resort. Possible to walk/paddle there (20 min), or accessible by boat (3 min. Very long and rippable left. It can barrel in the inside when the wind is offshore. It holds size very well and can be surfed even huge. Best mid to low tide. Perfect intermediate wave when not too big. In front of the resort. Possible to walk/paddle there (20 min), or accessible by boat (3 min). Just next to Pesangan Left. Long and ripable right, maybe little more steep then the left sister. It can barrel in the inside when the wind is offshore. It holds size very well and can be surfed even huge. Best mid to low tide. Perfect intermediate wave when not too big. Fun and gentle wave breaking in front of Dako Island (located in front of the resort) over a deep coral reef. Good wave for learning but can become big during the winter season. Mid to high tide only. Accessible by boat from General Luna of the resort (10 min ride). Very Long right hander wave that breaks in front of the village of Salvation. Beginner friendly wave when small but heavy when big. If you get caught inside it s a long paddle out. Sometimes might be little fast, get lot of speed. (January to March) and mid to high tide. Access by boat from Salvation. Need some swell to break. It works at all tides but better mid tide. A long barreling left wave that breaks over a rocky reef. Surfed all tides. Low tide can be quite shallow and you have to jump out the last final section because breaking over dry reef. On big swell it s very heavy. 1h motorbike drive from General Luna or in front of Kermit Siargao North Shore.. Easily accessible. It's a very powerful wave breaking over a shallow reef. The wave is one of the best lefts in the island, however it only starts to work at 3 feet. Best at high tide to mid tide. Low tide can be dangerous since it gets pretty shallow in places and close out. If the swell direction is good and wind offshore you can have 5 seconds barrel. You must chose the wave carefully some close out heavily. Super fast wave. Respect locals here and Take turns, it used to be a secret wave until few years ago. NOT A BEGINNER WAVE. Easily accessible. Breaking in between Cloud 9 and Tuason Left. Working only on South Swell. Mid to High tide only. Another powerful wave breaking over a quite shallow reef. There are 3 different take off point. On big days the 3 “waves” align and you can have 200 meters ride with some barreling section. A first class left hander wave that wraps around a small island. Fun wave under 3 feet - over that size it becomes very heavy but still breaks perfectly. When big it becomes one of the heaviest wave in Siargao be ready of long hold down. Great for pictures. Great tubes and can handle big swells. Good low to medium tide. Good on north wind. If big good on high tide as well. Accessible by boat from Cloud 9. An excellent long right hander wave that breaks and barrels next to a island. 100 meters form Stimies. Best with no wind at low to mid tide. When big get heavy, clean out set might come. It can hold swell up to double overhead. Accessible by boat from Cloud 9. Needs medium to large swell direct from the east to south east. This wave looks like an upside down, teardrop shaped barrel. It's a heavy break and only for expert surfers. Better high tide. Accessible by boat from General Luna (15 min). First class wave breaking in the north tip of Dako island. Normally right hander. When big it offers some barrels - this is not a beginner's wave. Beware not to get caught in the inside because it can be difficult to get out to the line up again. Accessible by boat from General Luna (10 min ride). Quality left hander wave that breaks in front of Pilar. Very long wave with few barreling section and super rippable wall. Sometimes might be little fast, get lot of speed. Good when the wind come from the north (January to March) and mid to high tide. Access by boat from Salvation or paddle out from Pilar. It need a quite big swell to break, mid to high tide only. In front of General Luna is Guyam Island. There are many breaks behind the island. You can choose your own peak, no competition for waves. Best low to medium tide. Accessible with a boat from GL. Within 2 hours boat or motorbike ride there are approximately 10 world class breaks, which are always uncrowded and well worth the trip. There are also a few well guarded secret spots that can be found if you look hard enough. If the swell conditions are good Kermit organizes trips to these amazing waves daily.